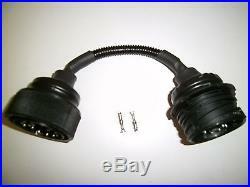 BMW E30 wiring harness Adapter to Install/Swap engine M50/S50 from E36/E34. This wiring harness was developed to allow you to install / swap an E36 engine into a E30 car. The BMW E30 wiring has a 20 pin plug at the engine bay, while the E36 uses a 25 pin plug at the engine bay. With our adaptor cable you only need to connect it between the 20 pin and 25 pin connectors. 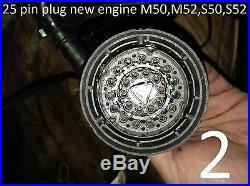 This adapter was developed and tested to the following engines M50, M52, S50, S52 from E36 or E34. 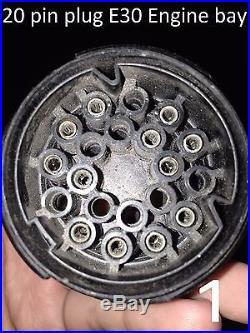 If your BMW E30 is before 7/1987 you must add 2 cables to the wiring harness with 2 single pins included. For the installation, you will have a guide to help and explain you what to do. We Speak English, Portuguese, French and German. Most items will be sent within 24 hours. Please check out our feedback! VAT invoice: all our items include a VAT invoice supplied with the goods. Please tell us your VAT number for correct invoice. The item “BMW E30 wiring harness Adapter Install/Swap engine M50 M52 S50 S52 from E36/E34″ is in sale since Wednesday, August 02, 2017. This item is in the category “Vehicle Parts & Accessories\Car Tuning & Styling\Engine, Tuning & Chips\Other Engine Tuning”. The seller is “bruno_steering” and is located in Leiria. This item can be shipped worldwide.